Working in an office can mean hours upon hours of sitting. After a long day at your desk, you may go home with an aching back and stiff muscles. Traveling can have a similar impact on your body. Luckily, there’s a simple remedy: walking. Danny and Katherine Dreyer, authors of CHI WALKING, share how to take a “Loosening Walk” that will leave you feeling refreshed from head to toe. What Does This Walk Do? 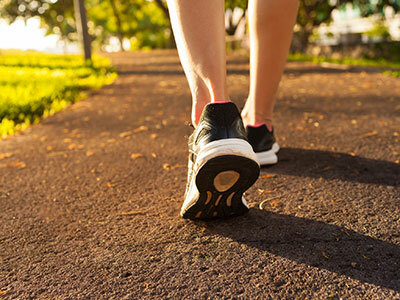 When you find yourself holding lots of tension in your body, this walk will work wonders to loosen your muscles and joints, leaving you feeling like you just had a great massage. It’s a good walk if you’ve been sitting in a car or an airplane for hours on end. As soon as possible after traveling, treat yourself to a loosening walk and you’ll be back to normal before you know it. During this walk you’ll be walking at a relaxed pace while doing a series of loosening exercises that focus on specific areas of your body. Before starting your walk, stand in place and shake your whole body. Let your arms dangle and shake your hips and spine so that your body jiggles all over. This will help to release some tension in your muscles right from the start. Begin walking at an easy pace. During this walk you’ll be starting with your head and working your way down your body to your feet. Loosen your face. Tense all the muscles in your face for 5 seconds and then relax and let them go. Do this for 1 minute. Loosen your neck. Do 5 neck rolls (tilting your head around in a circle) in one direction and then 5 in the opposite direction. They don’t have to be big circles—any amount of neck roll helps. Keep alternating neck rolls in both directions for 1 minute. Loosen your shoulders. Roll one shoulder at a time in a big circular motion (forward, upward, rearward, and down) until it comes back to its neutral position. Do 5 shoulder rolls on one side and then do 5 more with the opposite shoulder. Alternate back and forth for 1 minute. Loosen your arms. Dangle your arms at your sides and let them go totally limp while you shake your wrists. This will loosen and relax all the muscles up and down your arms. Do this for 1 minute. Loosen your spine. Bend your elbows to 90 degrees and hold them tightly against your sides (don’t let your arms swing). Hold your upper body motionless and let your lower body rotate fully with each stride. You’ll feel a slight twist along your spine as you walk this way. This twisting motion will loosen up all the ligaments and tendons along your spine, so really allow the twist to happen. Walk for 1 minute feeling the twist of your spine and then relax your arms, letting them swing normally again. Loosen your hips and pelvis. Every time your leg swings toward the back, allow your hip to go back with it. This motion will increase the rotation of your pelvis and allow your hips to increase their range of motion. You’ll feel like you’re taking giant steps. Do this for 1 minute. Shorten your stride and walk with your lower legs totally limp. Just pick your feet up off the ground with each step and you’ll be able to keep your calves and ankles relaxed throughout each stride. Soften your feet with each footfall. Walk this way for 1 minute. Cycle through the focuses of each body section in 1-minute intervals and then start over again at the top and work your way to your feet. In a 30-minute walk you’ll be able to do four cycles. This is a good walk even if you have only 15 minutes to spare. It’s also a great walk to do as the beginning of a longer walk. Try it for a lunchtime break and you’ll come back to your desk refreshed, relaxed, and ready for a calm afternoon of work. 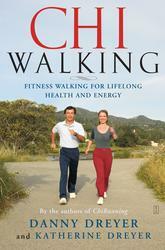 For more tips on ChiWalking–including instructions for the Cardio Walk, Upper Body Walk, and Calming Walk–pick up a copy of Danny and Katherine Dryer’s book ChiWalking. Want to feel better but can’t find the time to work out? Here’s how to get more exercise.